Posted on 27, August 2018 by EuropaWire PR Editors | This entry was posted in Energy, Gas & Oil, France, Industrial, Technology, Transportation & Logistics and tagged CO2 emissions, GTT, LNG fuel, Marine fuel, marine industry, Philippe Berterottière, Rolf Stiefel, ship owners, Timo Koponen, vessels, Wärtsilä, WinGD, ‘green’ propulsion. Bookmark the permalink. Saint-Rémy-lès-Chevreuse, France, 27-Aug-2018 — /EuropaWire/ — Three of the marine sector’s major technology companies, WinGD, Wärtsilä and GTT, have agreed to collaborate in making the use of LNG fuel a truly viable option for ship owners and operators. By combining their expertise and experience, the three companies deliver an effective, streamlined approach for achieving compliance with environmental legislation. LNG fuel is considered a key enabler of ‘green’ propulsion for ships. It has virtually no sulphur content, produces 80 percent less nitrogen oxide (NOx) and 30 percent less CO2 emissions than conventional marine fuels, and is competitively priced. With LNG being more widely available and accessible, it is now a feasible green fuel option. “There is a wind of change blowing throughout the global marine industry. The conservative barriers that once resisted switching to a “new” fuel are falling down, and LNG is now being accepted as a fuel for all types of ships. Through collaboration with other industry leaders, we aim to speed this process,” says Timo Koponen, Vice President, Processing Solutions, Wärtsilä. A joint press event, along with happy hour will be hosted by WinGD on Wednesday, September 5th, 15:00 at the upcoming SMM event in Hamburg, on Stand A5.207. The event, open to all members of the media, will offer the opportunity to hear from these three industry experts about how collaborations are the key to sustainable shipping. A limited number of media interview opportunities with spokespeople will also be available. If you’d like to reserve a time slot, please contact kami.paulson@wake-media.co.uk / +44 208 6861728. 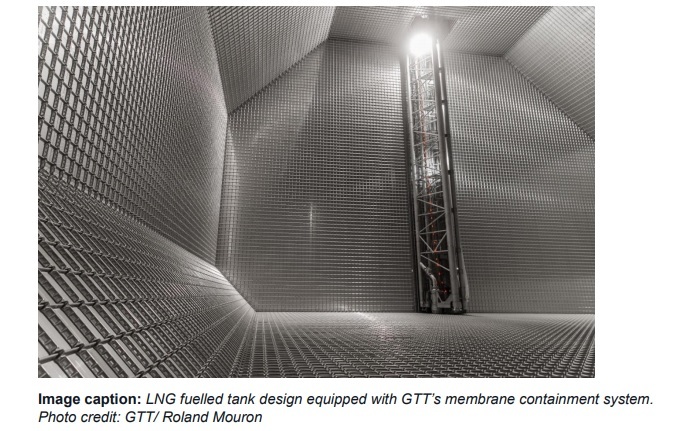 About GTT: GTT (Gaztransport & Technigaz) is an engineering company expert in containment systems with cryogenic membranes used to transport and store liquefied gas, in particular LNG (Liquefied Natural Gas). For over 50 years, GTT has been maintaining reliable relationships with all stakeholders of the gas industry (shipyards, shipowners, gas companies, terminal operators, classification societies). The company designs and provides technologies which combine operational efficiency and safety, to equip LNG carriers, floating terminals, and multi-gas carriers. GTT also develops solutions dedicated to land storage and to the use of LNG as fuel for the vessel propulsion, as well as a full range of services. GTT is listed on Euronext Paris, Compartment A (ISIN FR0011726835 Euronext Paris: GTT) and is notably included in SBF 120 and MSCI Small Cap indices. About Wärtsilä: Wärtsilä is a global leader in smart technologies and complete lifecycle solutions for the marine and energy markets. By emphasising sustainable innovation, total efficiency and data analytics, Wärtsilä maximises the environmental and economic performance of the vessels and power plants of its customers. In 2017, Wärtsilä’s net sales totalled EUR 4.9 billion with approximately 18,000 employees. The company has operations in over 200 locations in more than 80 countries around the world. About WinGD: WinGD is a leading developer of two-stroke gas and diesel engines for marine propulsion. Headquartered in Switzerland since its inception as the Sulzer Diesel Engine business in 1893, it carries the legacy of excellence in design. With worldwide offices, research and training centres, WinGD employees represent over 25 different nationalities providing rich innovation and progressive thinking.